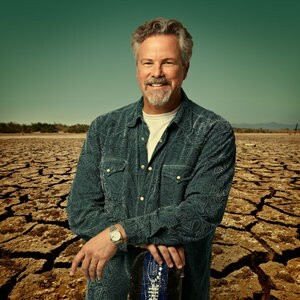 You may or not be familiar with Texan Robert Earl Keen as he has never been a mainstream country or pop artist, preferring instead to stay on the fringes and record his own brand of folk, roots, blues, protest, outlaw, alt-country (Americana) music. And like bluegrass, Americana generally gets marginalized by the major record labels and promotors who can’t see a way to take such a niche market to the bank. So Keen has been content to build his audience by prolifically recording dozens of very interesting albums of original songs on a variety of labels and unorthodox distribution channels. So far, so good and today he is one of the most popular and well-known Americana artists working today. His songs have been recorded by everyone from George Strait to the Dixie Chicks. I rarely played his stuff on my radio show because he never claimed to be a bluegrass artist … UNTIL NOW! I just received a copy of his new album Happy Prisoner: The Bluegrass Sessions and immediately checked to see who the backing musicians were on the album. After all, that’s what makes a bluegrass album a bluegrass album, right? You’ve got to have the right pickers who can give you that bluegrass sound. Lots of country or pop artists have cut bluegrass albums—recent examples being Alan Jackson , Dolly Parton, Dierks Bentley and John Driskoll Hopkins of the Zack Brown Band. In each case, these artists employed some of the Nashville A-list studio musicians who are able to take any song, whether it had bluegrass content or not and turn it into a bluegrass hit. There are some amazing bluegrass musicians in Nashville who can make almost anybody’s record a great bluegrass record. Well, I’m happy to report that Robert Earl Keen did not go that route. Instead, he used his own band (which includes some notable non-bluegrass elements like keyboards, drums and electric guitar) and added some bluegrass authority in Sara Watkins (Nickel Creek) on fiddle, Danny Barnes (the Bad Livers) on banjo, and Kym Warner (Greencards) on mandolin. Singing with Keen is Lyle Lovett, Peter Rowan and Natalie Maines (Dixie Chicks). And rather than trying to turn Keen’s original songs into bluegrass standards, Keen chooses to turn a dozen or so bluegrass standards into Robert Earl Keen songs while using these great musicians to pay homage to their bluegrass roots. It’s clear from listening to each cut that the musicians find a good groove for each song and have a blast improvising and trying to do something truly unique. I’m reminded of when Steve Earle recorded his bluegrass album with the Del McCoury Band a few years ago, or when Bob Dylan cut the Stanley Brothers’ classic “Lonesome River” on Ralph Stanley’s “Clinch Mountain Country” album. Robert Earl Keen gets to do what he does best on Happy Prisoner while all the backing musicians are left to improvise and create something truly unique. Yes, it’s a bluegrass album featuring real bluegrass songs but it’s nothing like you’ve ever heard before. That makes it a perfect fit for KSON’s Bluegrass Special. Be listening! This entry was posted in Bluegrass, KSON's Bluegrass Special and tagged Bluegrass, kson, Robert Earl Keen, Sara Watkins. Bookmark the permalink. Just found out about your show by complete accident 3 weeks ago picking friends from the airport late on a Sunday. Thank you so much for playing some awesome music. Furthering my amazement, I was listen Sunday before last and a song came on and I said to myself, “man that blue grass guy sounds just like REK” (Robert Earl Keen, just to be clear). Sure enough it was the “Road goes on forever” man himself…on the radio in San Diego! Never in a million years did I think that would happen. I saw him live for the first time in 2006 at “Chillifest” outside College Station, TX, and haven’t stopped listening since. Mr Keen and I have both attended Texas A&M and he is a bit of legend in those parts. Although we just call his music “Texas Country”. Thank you again for bringing REK’s and all of the other awesome music to SOCAL. I am definitely a huge fan of your show now, and will be tuning on Sundays from here out. P.S. – Also just found out that I can stream your shows, just not on an iPhone. Life is pretty good now. Thanks for your message. I’m kind of a newbie to the talents of Robert Earl Keen but when I got a copy of his “Happy Prisoner” album I was very impressed with his sound. I’ll check out his other albums and if I ever get a chance to see him live, I’ll take advantage of the opportunity. I’m glad you caught one of his songs on my radio show. I’ll continue to play cuts from his album. Thanks for listening and if you ever have any special requests please let me know.